Long time no post... I guess nobody who visits Independent Painters wants to read this kind of stuff so I'll jump right in to the content. 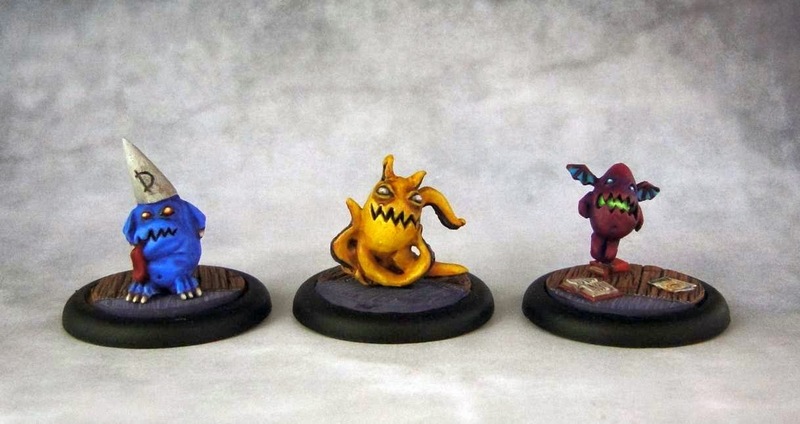 I've been recently working on another Dreamer crew with some extra minions, some of which I haven't painted before. Here's the core of the crew with some close-ups of the master(s). Chompy's skin was a big challenge. 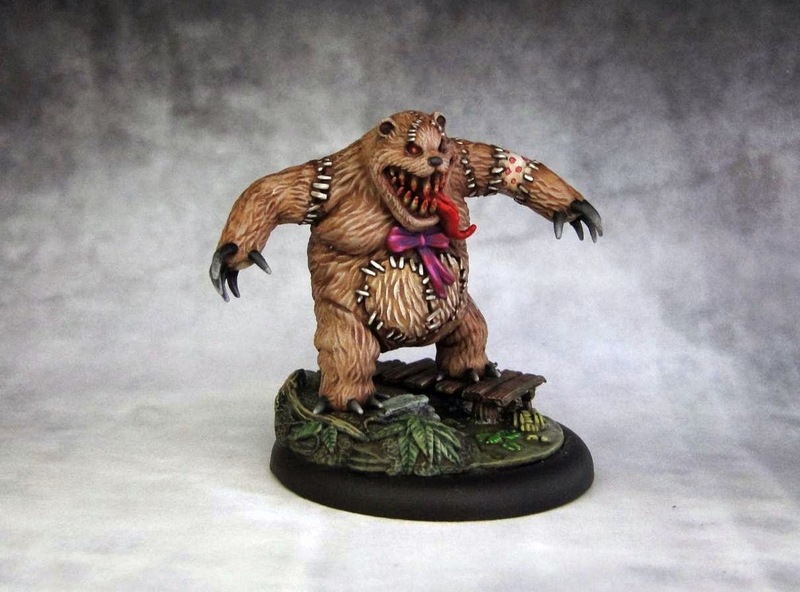 U used several highlights to bring it up to pale ghoul-like tone and then followed with glazes of brown, green and black. As a result it doesn't have a homogeneous look, which is something that I'd been aiming for. Red loincloth adds a much needed distraction by adding an element of contrast. I've also added the blood effect on his claws and around them. I did that after varnishing to make sure that i get a glossy effect and the blood looks fresh. The Dreamer needs his totems to act so here they are - three little Daydreams. 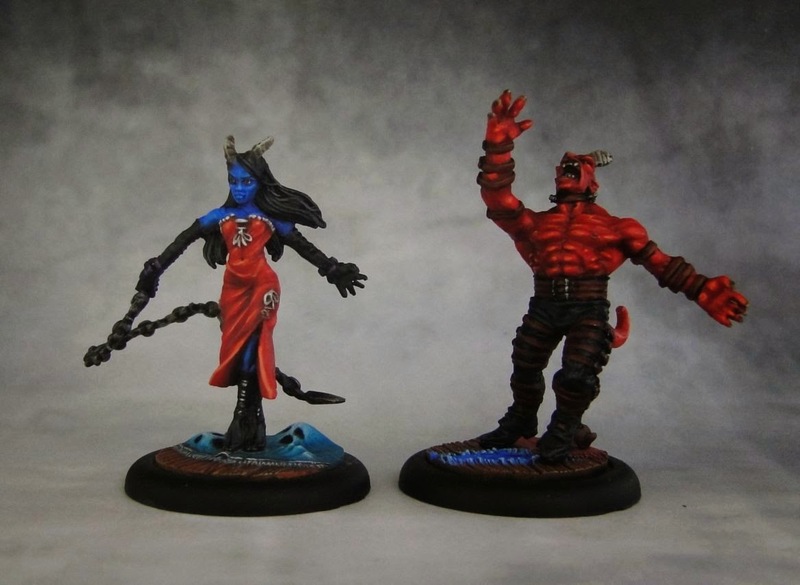 I really like these minis, they have this slightly comical 'little evil' look to them. 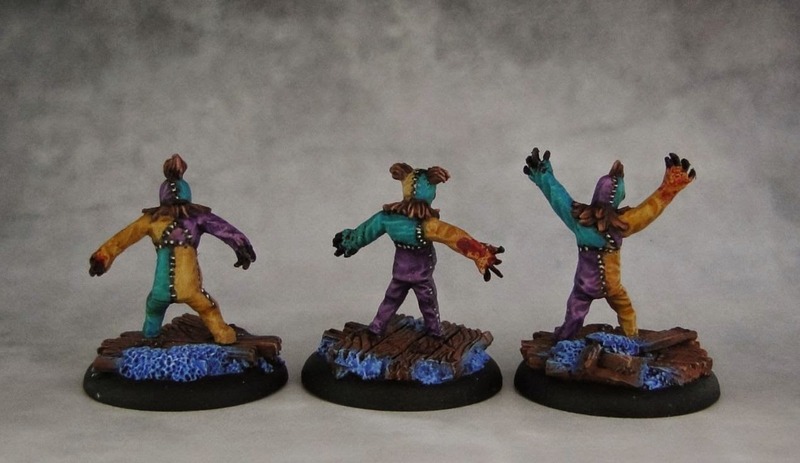 I chose to use more vibrant colors on them as I thought this would go well with the funny sculpts. And yeah, the blue one is definitely my favorite. 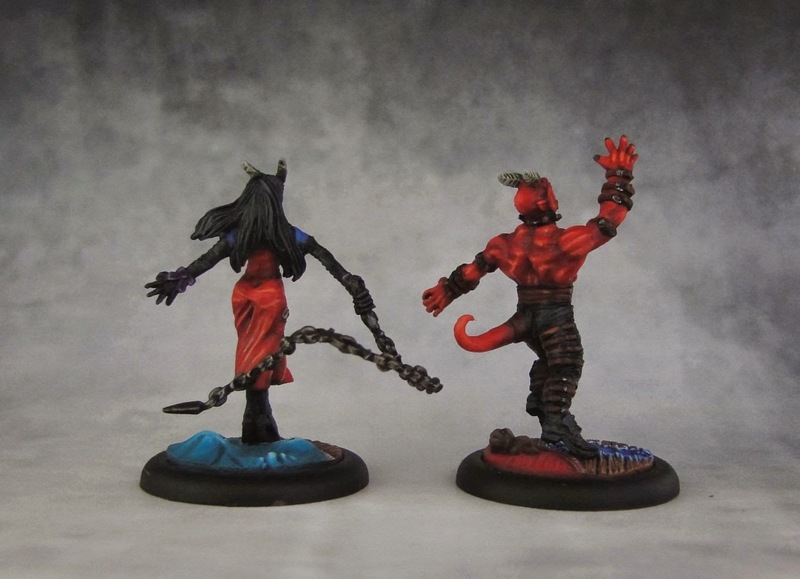 Next up are the evil twins - Lelu and Lilitu. As always, I struggled with taking pictures of red colors. For some reason my camera gets the red wrong, especially when it's highlighted to slightly orangish tones. I loses focus and the balance of red is wrong. I haven't yet found a solution to this problem so you just have to take my word that it really does look good in reality. Alps, the mischievous little imps are a lot of fun to work with. Their exaggerated features mixed with short legs and long arms make them look like some kind of small mutants. Their ragged clothing adds to the feel. The pics turned out a bit too dark so the highlights are really not that well shown here. inconspicuous so I've added some gore effect to their claws to make them look a bit more menacing. These two were a lot of fun to work with. Insidious Madness is just... well, I don't know where to begin. 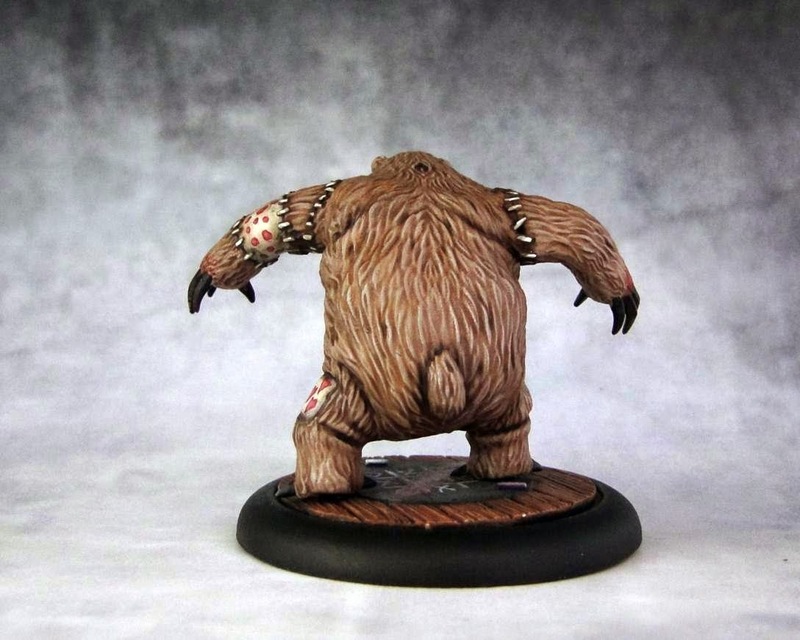 It's an out-of-control miniature and it's really hard to say what it actually presents. Some kind of magical-biological mutation with arms, teeth and eyes. And that's about it. 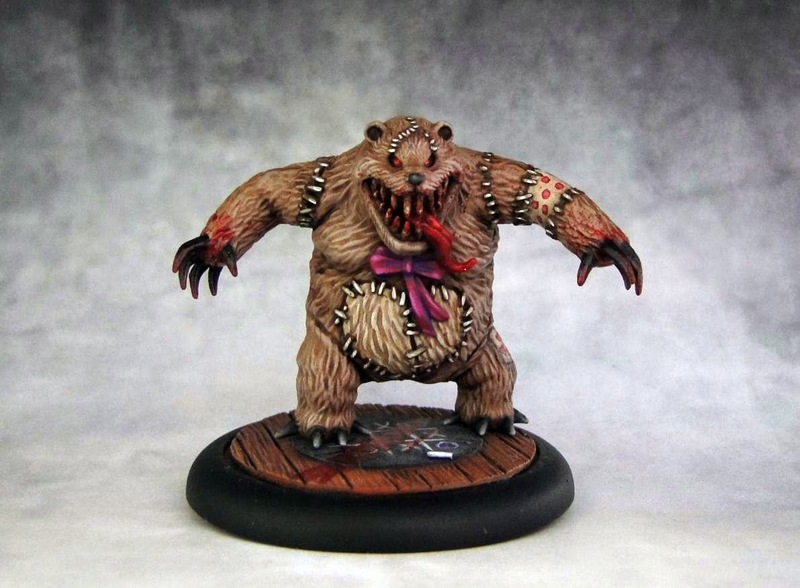 Speaking of Teddy, I finally had a chance to paint a plastic Wyrd miniature from wave 2. 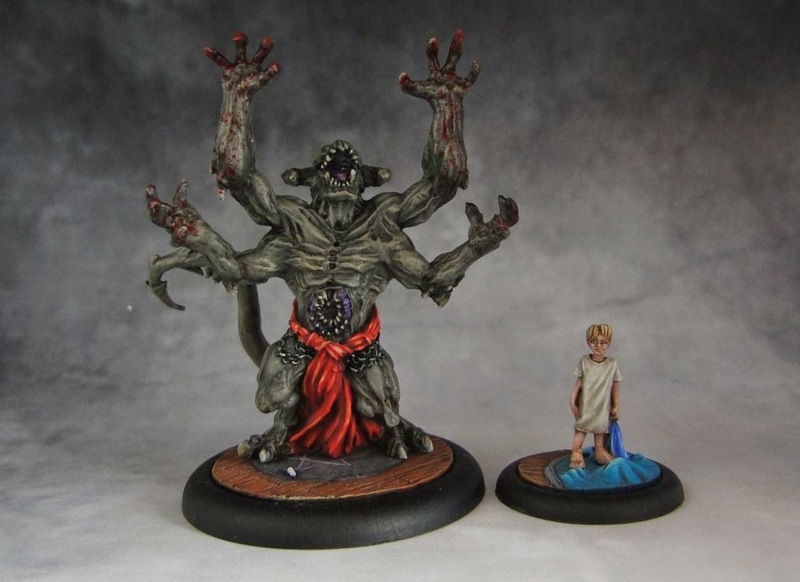 When I first saw the digital render of this miniature I wasn't impressed. It seemed somehow flat, with hardly any noticeable details and an overall lack of texture on the fur part. I was pleasantly surprised when I saw the miniature. 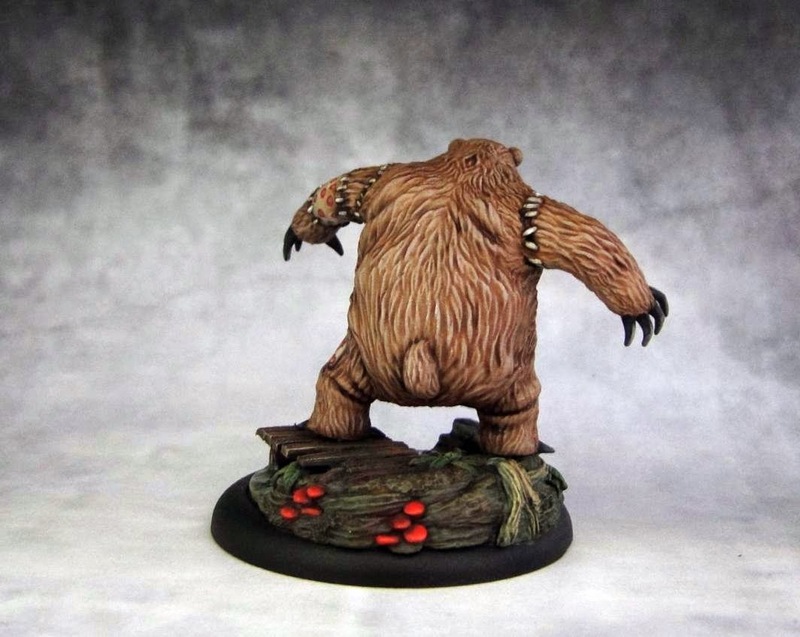 It's really well detailed and the fur texture is as good as it gets. The only potential problem with the model is that the main body is made of two halves and you need to work over that with GS to recreate the fur texture along the line which marks the area where the halves are glued. 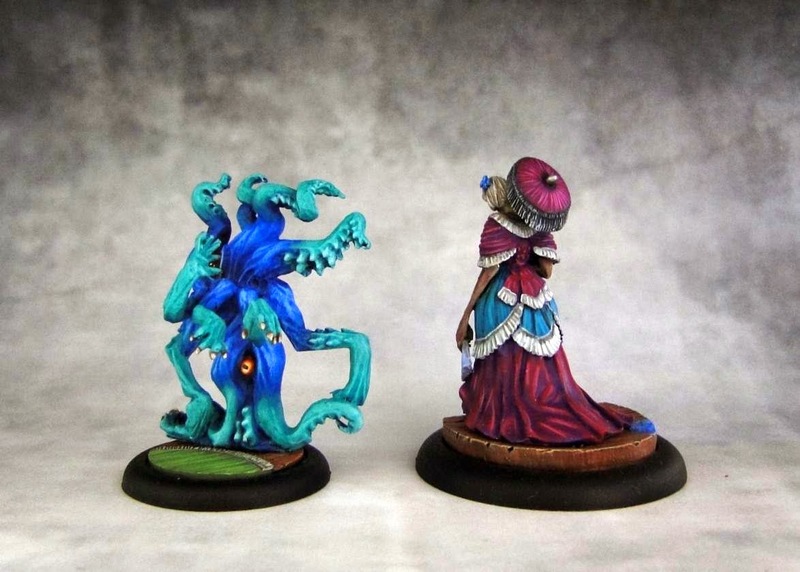 It's something that people new to the hobby might find tricky. It's not a big deal but it can look pretty bad after painting as there'll be a dark line along the whole body of the model. 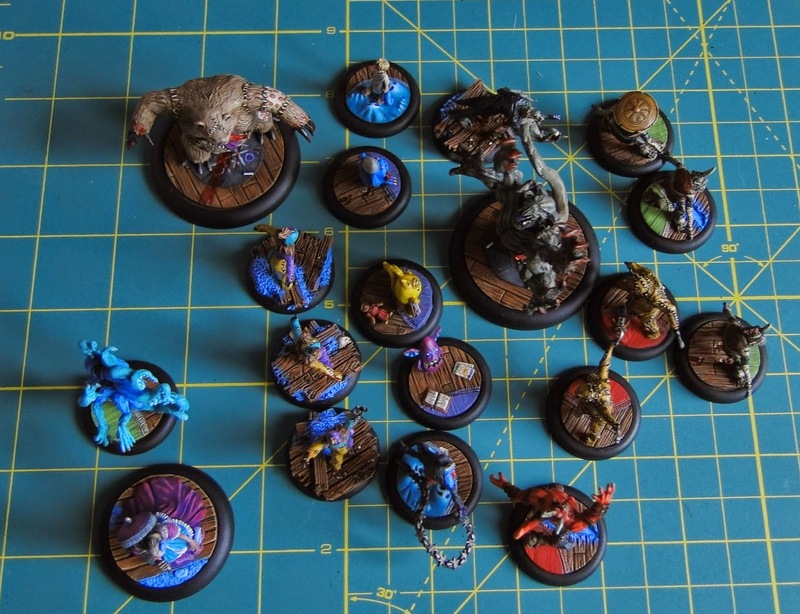 I used Wyrd Orphanage base inserts for most of the minis from this batch. 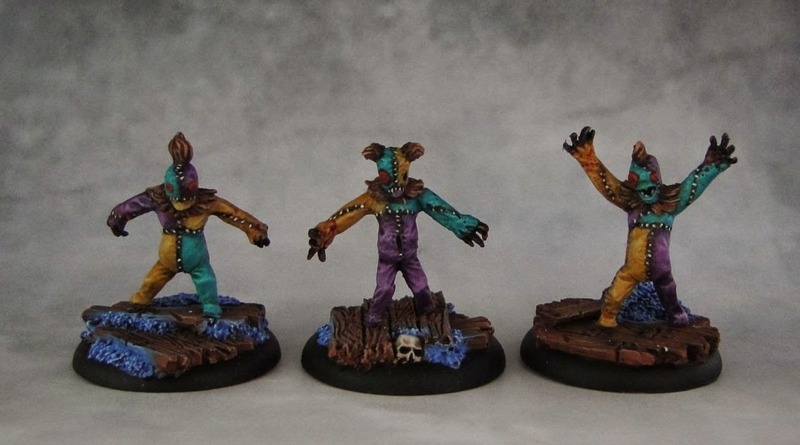 They are absolutely fntastic and have very nice details like ghosts trying to come through a carpet (as seen on Dreamer's and Lilitu's bases), weird tears in the wooden floor (the texture of wood is exceptionally well cast) or little bits like toys lying around. 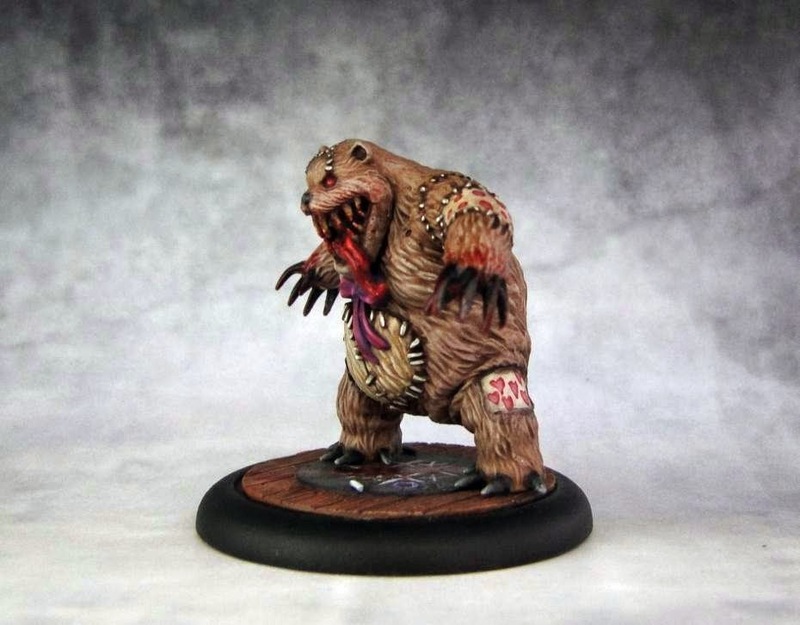 I also painted a tic-tac-toe pattern on Teddy's base, with three winning Os crossed out with blood. A bit creepy I know but I thought it would go well with the haunter orphanage theme. 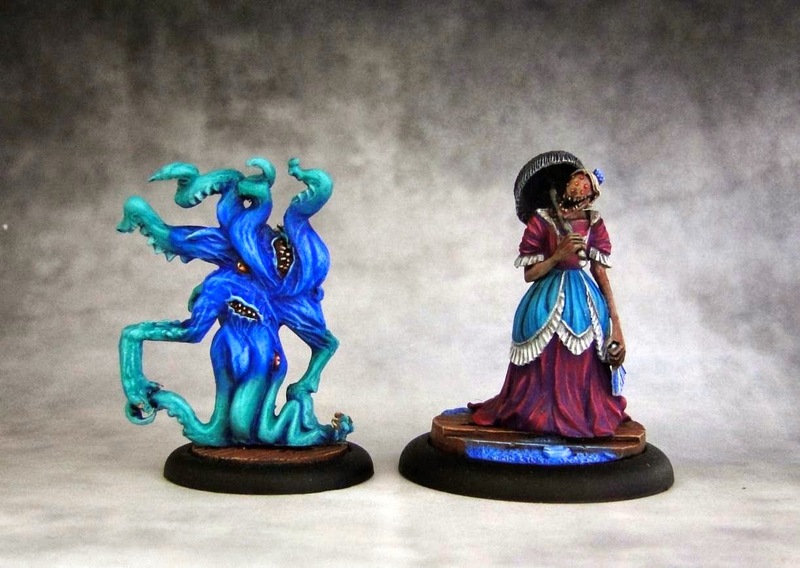 The only exceptions are Wicked Dolls as they have resin casts from Micro Art Studio. 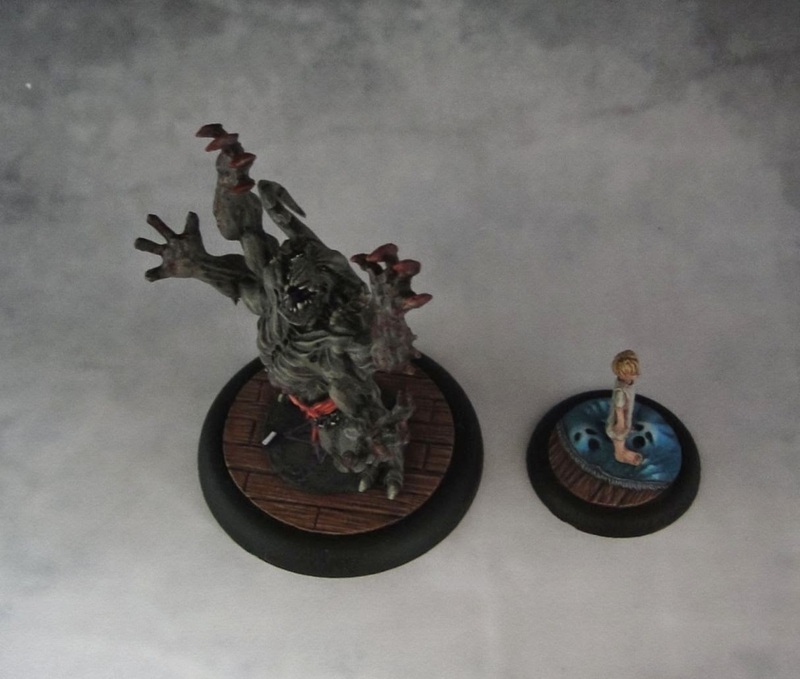 I also couldn't really fit the Widow on a 40mm Orphanage base insert. The bear pelt and the chimney pieces do look great but with a large model like her it's just impossible to fit everything there. I ended up using another base insert and painting it with the same color scheme as the others, only adding some bluish effect where the sand is supposed to be. Here's the whole lot shot from above. 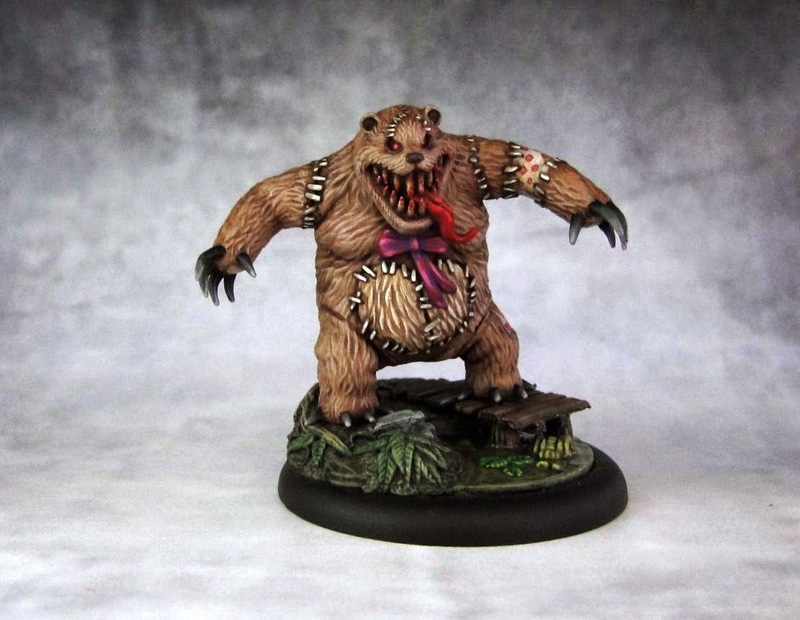 And one more thing - another Teddy that I painted along with the first one. This one features a Bayou-themed base (if you look closely you'll notice a crocodile there!). The Bayou base inserts have a stunning amount of detail. I didn't really know what to begin with at first. Painting his fur isn't as easy as it may seem. Plan drybrush won't do the trick here as the fur is way too thick and covers almost the whole body. 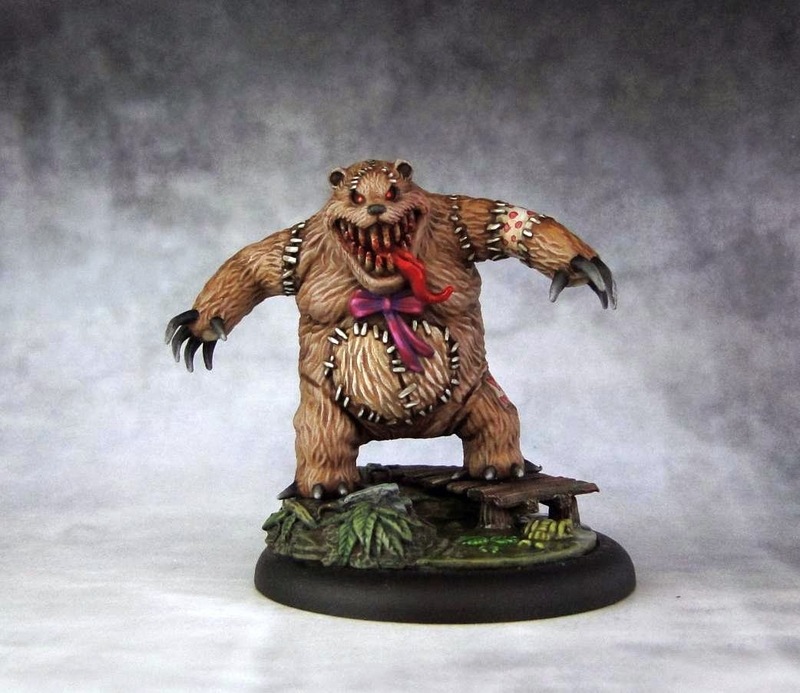 I worked with glazes and washes to shade the recesses before moving on to brighter parts. Took a while but I'm pretty happy with the effect. Yet another impressive crew. Great job! 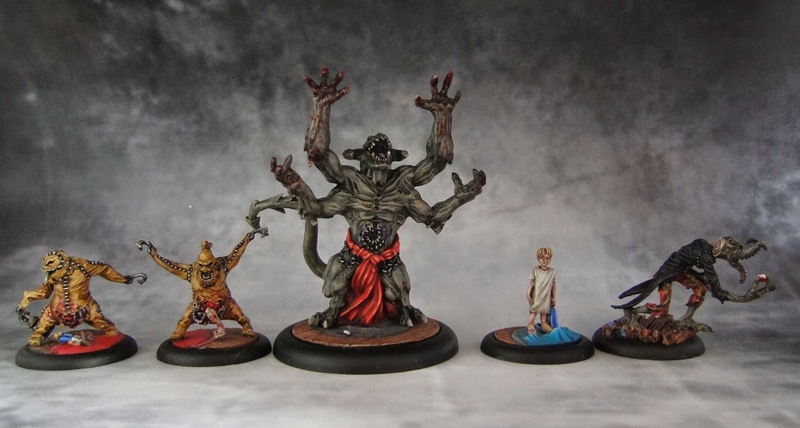 It's funny how among all those monsters, daemons and whatnots the little boy is the most creepy mini ;) Anyway, awesome work on all of them! Thanks! 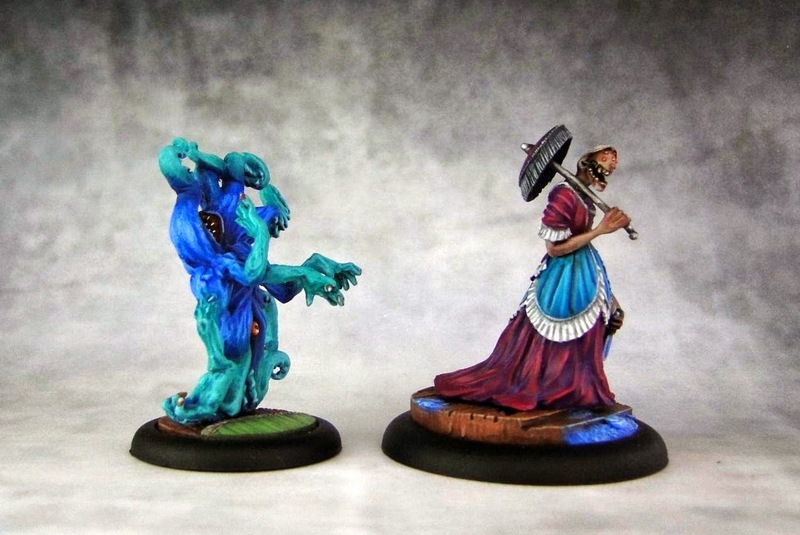 The Dreamer is probably the most twisted master in Malifaux. Nothing beats a mad child that thinks he's playing with his "friends" by commanding his nightmares to tear others to pieces.